In the end, our political leadership proved unable to defend the constitutional and democratic roots of the system or resist the generals’ demands. Pakistan is to have military courts once again. To establish them the politicians have agreed to distort the principle of separation of powers, smash the edifice of rights upon which the Constitution is built and essentially give up on fixing decrepit state institutions. Had the same time and effort spent on winning consensus for military courts gone into urgent reforms and administrative steps to fix the criminal justice structure, the existing system could have been brought into some semblance of shape to deal with terrorism. Sadly, the political leadership has abdicated its democratic responsibilities. Surrender perhaps comes easily. For a country that has been beset by repeated military coups, the Dawn editors rightly note the risk in granting more powers to the military. The National Assembly and Senate on Tuesday passed the 21st Constitutional Amendment Bill 2015 and Pakistan Army Act 1952 (Amendment) Bill 2015. The Constitutional Amendment Bill was passed with 247 votes – 14 more than the required two-third majority in the NA, and 78 votes out of 104 were passed in the Senate. The amendment – aimed to set up special courts to try militants – was not opposed by any member present inside the house. Lawmakers from Pakistan Tehreek-e-Insaf, Jamaat-e-Islami, Jamiat Ulema-e-Islam-Fazl and Sheikh Rasheed abstained from voting – in both the NA and the Senate. Each clause of the bill was voted for separately. The bill is now expected to be signed into law by the president this week. As long ago as 1866, just after the Civil War, the Constitution stood for the principle that, if the civilian courts were open and functioning during wartime, trials of civilians charged with crimes of war should be tried in those courts, not in military tribunals. That was the Supreme Court’s decision in the case of Ex parte Milligan. Perhaps the only good aspect of Pakistan’s move to establish military courts is that the bills carry a two year sunset provision. Sadly, though, given the current cowardly status of Pakistan’s lawmakers, it would not be surprising for regular two year “extensions” of the laws to continue in perpetuity. Just like our endless extensions of unconstitutional wiretapping under FISA. General Raheel Sharif, Chief of Army staff today visited Afghanistan and held separate meetings with Afghan President Ashraf Ghani and General John F Campbell, ISAF commander. 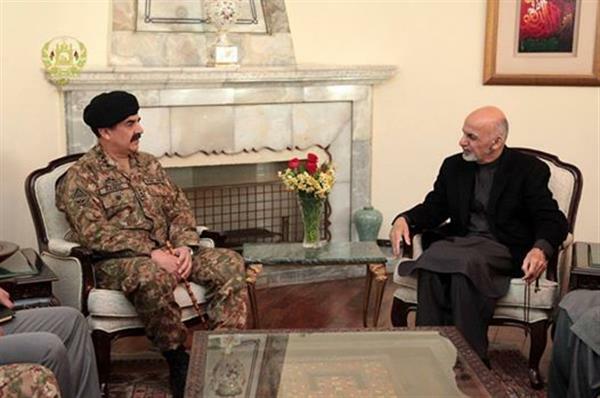 Matters related to security situation along Pak-Afghan border region came under discussion. Vital elements of intelligence were shared with concerned authorities, with regard to Peshawar incident. Afghan President assured General Raheel Sharif that Afghan soil will not be allowed for terrorists activities against Pakistan and any signature found in this regard will be immediately eliminated. COAS also assured Afghan President full support to the Unity government in all spheres including joint efforts against terrorists. ISAF commander also assured of its complete support in eliminating terrorist in his area of responsibility. Following his visit, General Sharif said that the Afghan president and ISAF commander assured him that the Taliban would not be allowed to use Afghan soil as a launching pad for attacks on Pakistan, exposing the simmering distrust that remains between the sides after 13 years of war. The general’s comments come after Afghan and NATO coalition leaders have for years pleaded with the Pakistani government to do more to keep the Taliban from using the tribal belt as a safe haven for recruiting fighters and launching attacks into Afghanistan. But after the Tuesday’s deadly attack by Tehrik-e-Taliban Pakistan (TTP) on a military-run school in Peshawar, it is possible the Pakistani armed forces and civilian government in Islamabad are more inclined to crack down on terrorism and seek help in doing so than ever before. A number of security analysts have encouraged that view, arguing that Afghanistan and Pakistan should come together and establish a joint counter-terrorism task force. Other steps that Pakistan has taken have been swift. Military courts for trial of terrorism suspects are being established and Pakistan’s moratorium on the death penalty for terrorism offenses has been lifted. Six executions are expected within the next 24 hours. In choosing to move forward with military courts, I guess Pakistan is overlooking the horrible track record in the US for military commissions at Guantanamo when compared to trying terror suspects in criminal court. “I’ve taken the decision after consulting religious scholars and tribal leaders,” said Muaweya whose group had been blamed for several deadly attacks in the country, especially in Punjab. He also called upon other militant groups to renounce violence and come to the negotiating table as the country was passing through a critical juncture. “We will confine our practical jihadist role to Afghanistan in view of deteriorating situation in the region and internal situation of Pakistani jihadist movement,” Punjabi Taliban chief Ismatullah Muawiya said in a pamphlet faxed to the media, without clarifying further. “Pakistani Charge d’Affaires Syed Muazzam Shah was summoned to the Foreign Ministry on Sunday, and a strong protest was lodged over the declaration of war made by the Punjabi Taliban on the Afghan side of the Durand Line,” a Ministry’s statement said. The Dari-language statement was also emailed to The Express Tribune. “Such statements are against international laws and principles of good neighbourly relations,” the statement quoted the Afghan official as telling the Pakistani envoy. In response to the assertions of the Punjabi Taliban, officials of the Afghan Ministry of Defense (MoD) have warned that any attacks on Afghanistan would face harsh response from the Afghan National Security Forces (ANSF). The meaning of Zarb-e-Azb is sharp and cutting. It’s reportedly the sword used by Prophet Muhammad (pbuh) in the battle of Badar. ISPR press release announces launch of military operation. “DG ISPR has said that on the directions of the Government, Armed forces of Pakistan have launched a comprehensive operation against foreign and local terrorists who are hiding in sanctuaries in North Waziristan Agency. The operation has been named Zarb-e-Azb,” said the press release. The ISPR statement went on to add that terrorists in North Waziristan had waged a war against the state of Pakistan and had been disrupting life in all its dimensions, stunting our economic growth and causing enormous loss of life and property. “They had also paralysed life within the agency and had perpetually terrorised the entire peace loving and patriotic local population,” the statement added. “Our valiant armed forces have been tasked to eliminate these terrorists regardless of hue and colour, along with their sanctuaries. With the support of the entire nation, and in coordination with other state institutions and Law Enforcement Agencies, these enemies of the state will be denied space anywhere across the country. As always, armed forces of Pakistan will not hesitate in rendering any sacrifice for the motherland,” said the statement. The operation has included air strikes by Pakistan’s air force along with ground action. Notably, there also have been at least three US drone strikes apparently coordinated with the offensive. Remarkably, Pakistan’s Foreign Office is warning diplomats in Karachi to be on guard and to restrict their movements. Although the warning does not appear to mention a link to the action in North Waziristan, it seems likely that the military action is seen as contributing to increased risk of terror attacks across the country. On the one hand, the movement of internally displaced persons (IDPs) from North Waziristan Agency provides officials an opportunity to vaccinate children who were inaccessible to health workers since June 2012, on the other hand, there are concerns that the virus could spread with the movement of these children. These fears are exacerbated by the fact that the movement is taking place during the summer season, a high transmission season for the poliovirus. Speaking with The Express Tribune, Acting Country Head of World Health (WHO) in Pakistan Dr Nima Saeed Abid said all efforts are being made to vaccinate children from Waziristan at checkpoints set up for IDPs. So far a total of 221,253 children have been vaccinated against polio at check posts set up, according to the Prime Minister’s Polio Monitoring and Coordination Cell. I will try to keep an eye on developments in this operation but will be traveling again next week. Postscript: While this post was being written, Pakistan announced that the Haqqani Network is among the targets of the offensive but that the offensive is Pakistan’s alone rather than a joint US-Pakistan action. How can US drone strikes be part of a Pakistan-only offensive? It also should be noted that the military is providing death toll information for “terrorists” and soldiers but does not mention civilian deaths. Karachi’s Airport has resumed operations today, but a deadly late night attack shut it down for many hours overnight. It appears that ten militants entered the airport Sunday night, most likely uniformed as airport security personnel, and killed up to 18 people before they were killed by airport security and rapidly responding military units. The TTP, Pakistan’s Taliban, has claimed responsibility for the attack. The New York Times and Reuters, however, chose to be very selective in how they reported the TTP’s claim of responsibility. Both news outlets left out the TTP’s prominent mention of the US drone strike in November that killed TTP leader Hakimullah Mehsud in describing the TTP’s reasons for the attack. By contrast, AP and the Washington Post included the TTP’s reference to the drone strike. Heavily armed gunmen disguised as security forces attacked Karachi’s international airport Sunday night, killing at least 18 people before government troops regained control early Monday. The Pakistani Taliban claimed responsibility for the assault, which appeared to dash hopes for peace talks. The government said all 10 of the attackers were killed in more than five hours of fighting at the airport, which would bring the total number of deaths to 28. A doctor at Karachi’s Jinnah Hospital said 18 bodies were brought to the morgue there and that 11 of the dead were airport security personnel, the Associated Press reported. The bodies of the attackers remained in police custody. In a statement Monday, Shahidullah Shahid, a spokesman for the Pakistani Taliban, said the attack was in response to recent Pakistani military airstrikes in northwestern Pakistan and to a U.S. drone strike in November that killed Hakimullah Mehsud, the leader of the radical Islamist group. Shahid added the attack should be viewed as a sign that Prime Minister Nawaz Sharif’s efforts to engage the group in peace talks had failed. “The message to the Pakistani government is that we are still alive to react to the killings of innocent people in bomb attacks on their villages,” said Shahid, adding the attack followed months of intensive planning. The Pakistani Taliban claimed responsibility Monday for a ferocious overnight assault in Karachi that stretched into the morning in which gunmen infiltrated Pakistan’s largest international airport and waged an extended firefight against security forces that resulted in 29 deaths and shook the country’s already fragile sense of security. The attack “was a response to the recent attacks by the government,” Shahidullah Shahid, a spokesman for the Taliban, said by telephone. “We will continue carrying out such attacks.” He insisted, however, that the group was seeking to resuscitate peace talks with the government. The Pakistani Taliban, an alliance of insurgent groups fighting to topple the government and set up a sharia state, said they carried out the attack in response to air strikes on their strongholds near the Afghan border and suggested their mission was to hijack a passenger plane. “It is a message to the Pakistan government that we are still alive to react over the killings of innocent people in bomb attacks on their villages,” said Shahidullah Shahid, a Taliban spokesman. Shahidullah Shahid moreover dismissed the Pakistani government’s peace talks methodology as a “tool of war”. Shahidullah Shahid said the attack was planned much earlier but had been postponed due to the peace talks. The TTP spokesman in a statement issued to the media said that the attack was also carried out to avenge the killing of Hakimullah Mehsud in a US drone strike. “We carried out this attack on the Karachi airport and it is a message to the Pakistani government that we are still alive to react over the killings of innocent people in bomb attacks on their villages,” TTP spokesman Shahidullah Shahid said. Pakistani Taliban claimed responsibility for the attack, saying it was revenge for the army’s air strikes in areas along the Afghan border where the insurgents are based. By citing only Pakistan’s air strikes against the TTP, the New York Times and Reuters portray the Karachi airport attack as a problem that is solely due to politics internal to Pakistan. That is a gross misrepresentation of the situation, as the US drone strike on Hakimullah Mehsud came at an extremely critical time when the peace talks first began to look like a concrete possibility. That US strike was a huge external intervention by the US and clearly put Pakistan on a path to even more bloodshed. At least the Washington Post and AP allow their readers to see that blowback for US intervention played a significant role in this attack. Pakistani Troops Seize Miram Shah. Does That Remove Drone Strike Justification? Analysts cautioned that the surge in fighting did not appear to be the start of a much-anticipated military offensive across North Waziristan — a longstanding demand of American officials. But it did appear to spell an effective end to faltering peace talks between the government and the Pakistani Taliban. Pakistani soldiers seized control of a neighborhood dominated by foreign Islamist militants in the North Waziristan tribal district on Thursday as part of the most concerted military operation in the area in several years, a senior security official said. Who says there was no way between the combined capabilities of the US and Yemen Awlaki could not at least be attempted to be captured? “Troops used explosives to blow up more than a hundred houses belonging to militants in Machis Camp,” an intelligence official in Miramshah said. He added that artillery and helicopter gunships were targeting militant hideouts while troops on the ground had begun a door to door search operation for militants. The military also targeted suspected militant hideouts in the nearby town of Mirali. “The troops have destroyed about 300 shops in the main Mir Ali bazaar,” a local official told AFP. A spokesman for Inter Services Public Relations insisted the security forces were carrying out a ‘sanitisation’ operation in response to heavy shelling from militants on security installations in Miramshah following Wednesday’s air strikes in North Waziristan. Today’s figures put the death toll in this week’s operation at more than 80. It remains to be seen whether the CIA will re-start drone strikes around Miram Shah. While the peace talk process appears to be dead, if the military continues to hold some of the prime territory where US targets have resided, carrying strikes on those sites may be subject to a different prohibition. https://www.emptywheel.net/wp-content/uploads/2016/07/Logo-Web.png 0 0 Jim White https://www.emptywheel.net/wp-content/uploads/2016/07/Logo-Web.png Jim White2014-05-23 10:05:202014-05-23 09:28:57Pakistani Troops Seize Miram Shah. Does That Remove Drone Strike Justification? Has Afghanistan’s National Directorate of Security Infiltrated the Taliban? As we get into the final days before voting begins on Saturday for Afghanistan’s presidential election, the biggest question aside from the issue of who will win is whether the Taliban will succeed in its determination to disrupt the election through violence and intimidation. Rapidly unfolding events today represent either a remarkable combination of good work and good luck by Afghan authorities or the product of an infiltration of the Taliban by the National Directorate of Security, which is Afghanistan’s intelligence agency. Breaking news stories today inform us of Afghan forces capturing 22 tons of explosives from a Taliban hideout in Takhar province, the deaths of six Taliban commanders when a suicide vest went off “prematurely” (in Logar province) and the deaths of 16 Taliban commanders when a suicide bomber is said (by the NDS) to have developed differences with the leaders and decided to turn on them, exploding his suicide vest in Ghazni province. Afghan security forces have seized more than 22 tons of explosives, enough to make hundreds of bombs, the interior ministry said on Tuesday, four days before a presidential election. Taliban insurgents have declared war on the April 5 vote, calling it a Western-backed sham and threatening to disrupt it. “This discovery will prevent hundreds of bomb attacks and would have a significant impact on the overall security of the elections,” Sediq Sediqqi, an Interior Ministry spokesman, told Reuters. Sediqqi said the explosives, hidden in some 450 bags, were seized from a basement in the relatively peaceful northern province of Takhar, where the Taliban have gained ground in recent years. What remarkable timing! Just four days before the election, Afghan forces find a huge cache of explosives in a “relatively peaceful” province. Four days would not have been a lot of time to produce the hundreds of bombs and distribute them to voting stations, but that is still a lot of dangerous material to be removed from use. At least six Taliban commanders were killed following a suicide blast in eastern Logar province of Afghanistan on Tuesday. According to NDS officials, the incident took place around 12:30 pm local time in Charkh district. The officials further added that the Taliban commanders were looking to prepare a suicide bomber for an attack when the suicide bombing vest went off. Hmm. It’s the NDS and not local police who are cited by Khaama Press in this story. At least 16 senior Taliban commanders were killed following a suicide attack in eastern Ghazni province of Afghanistan on Tuesday. Afghan Intelligence – National Directorate of Security (NDS) said the incident took place in a Taliban leaders gathering in Gelan district. National Directorate of Security (NDS) following a statement said the Taliban leaders were planning coordinated attacks in Ghazni province when a Taliban suicide bomber opposed with the Taliban leaders plans and detonated his explosives. Wow. Sixteen senior Taliban commanders is a huge gathering for one spot. And isn’t it interesting that it would be during that gathering that a suicide bomber would suddenly become “opposed with the Taliban leaders plans” and decide to detonate his explosives, taking them all out? And on the very day of this event, NDS seems quite confident that the 16 killed were senior Taliban leaders. Further, the NDS even seems to already know that some of the Taliban leaders killed came from Pakistan. So did Afghanistan get incredibly lucky today, with a premature explosion taking out 6 Taliban leaders and a difference of opinion leading to a suicide bomber changing sides to take out 16 Taliban leaders, or is there another explanation? It seems to me that we have to at least consider that the National Directorate of Security has been developing assets inside Taliban cells and is choosing this pivotal week as the time to put those assets into action. Such assets could have provided the key information leading to the discovery of the explosives cache. It is also possible that these assets could have gained control of the suicide vests that went off today, either as the suicide bombers themselves or through some form of remote control, creating the appearance of accidents or betrayals. Whatever caused these events, when grouped together they represent a major setback for Taliban plans to disrupt the election. Will they be able to respond? https://www.emptywheel.net/wp-content/uploads/2016/07/Logo-Web.png 0 0 Jim White https://www.emptywheel.net/wp-content/uploads/2016/07/Logo-Web.png Jim White2014-04-01 09:33:492014-04-01 09:33:49Has Afghanistan's National Directorate of Security Infiltrated the Taliban? The first round of direct peace talks between the government and the Tehreek-i-Taliban Pakistan (TTP) leadership concluded on Wednesday, with both the sides reportedly reaching an agreement on several issues, DawnNews reported. Information Minister Pervaiz Rashid, however, did not share any details of the landmark talks, saying only that once the negotiators returned, it would be up to the government to make statements to media. The negotiations are part of a push by the government of Prime Minister Nawaz Sharif to negotiate a peace deal with the Taliban that would end a bloody insurgency that has killed thousands of people in recent years. Sources told DawnNews that the both parties sought guarantees from each other, during the talks, which were held at Biland Khel area of Shawa Tehsil on the border of Orakzai and North Waziristan tribal agencies bordering Afghanistan. The TTP also responded positively to the demands of indefinite ceasefire and the release of non-combatant prisoners put forward by the government’s committee, they added. Despite a degree of optimism and feel-good impression generated by the militant-handpicked committee, insiders believe the first direct face-to-face interaction with militants has hit a stalemate and unless some quick decisions are taken, it will be difficult to prolong the ceasefire. The ceasefire is to expire on Monday. According to an insider, the militants have set two conditions for continuation of the peace talks. One, the creation of a demilitarised peace zone in mountainous Shaktoi, South Waziristan, to allow freedom of movement and two, the release of non-combatants. The insider said the five-member militants’ committee sought written guarantees before they could commit to an extension in the month-long ceasefire. “For nearly seven hours, we talked to them about the destruction wrought by over a decade of violence, the loss of lives and property and displacement of people. “We said ‘let bygones be bygones, let’s bury the hatchet and make a new beginning’,” the insider said. “Nothing seemed to appeal to them. I have come back really disappointed. The chances of success and continuation are not terribly bright. This is a non-starter,” he said.